Absolutely beautiful weather today. And, with a little bug spray, the mosquitos weren't quite so bad as they have been. I started the day, after much coffee and watching the Sunday morning news shows, with the intention of mowing the entire lawn. Everything went fine, for awhile. I mowed the orchard (plums, apples, pears, and butternut trees), mowed the front yard and mowed most of the back yard before it all went to heck; the mower blades quit turning. After a bit of inspection, I found a sheared bolt on the deck holding an idler in place. No more mowing today. What to do; what to do. Well, I decided I must get the mower deck off before breaking into the wine. But, while I put off that job, I murdered some burdock and thistle and miscellaneous weeds around the farmstead with glyphosate. Then I took the mower deck off and determined that a trip to the dealer was in order to buy a part. Being Sunday, the trip would have to wait until tomorrow. So, I wandered into the shed and looked at the theoretical picker. I call this the theoretical picker because, in theory, it will be working someday and picking pounds and pounds of fiber per minute. But for now, it languishes, awaiting repair and maintenance. And inspiration. This is the actual picker that I started using today. Its a John Meck and very small. I bought it from an ad on facebook. Today, I managed to pick about 2 lbs of wool before running out of steam. With about 200 pounds to pick, I have only 100 days of picking left at that rate. Our trip to Wisconsin was delayed due to bad weather--we are flying there. Now it looks like we will be able to go the week after this coming. 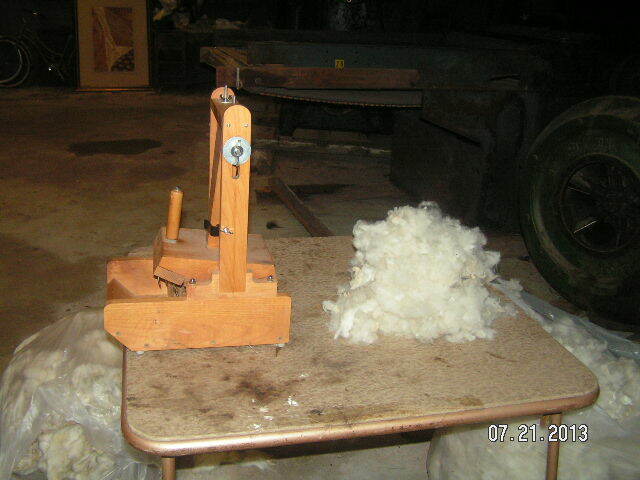 We hope to get a good look at the doffer comb, roving coiler and picker in hopes of gaining inspiration on finalizing some of the fine tuning on the carder and starting to work on the picker. Today Dad arrived promptly at 9 a.m. with spray paint in hand. We started out by cleaning the pulleys with solvent then applying painting tape and newspaper--the carder was getting a bit of a paint job. The rest of the morning we threw stuff out of the shed and made room for maneuvering both the picker and the feeder. The picker will be at the far south end of the shed. The feeder will be placed against the middle of the west wall--this is actually as far out of the way as we could think of putting it. In the afternoon, I cleaned out the little garage to store the lawnmowers in since I was told they could no longer be in the carding shed. Check out the teeth on this picker!